So today is March 2, and it is hard for me to believe how fast time is flying by! I'm linking up with Farley for the famous Currently! We are waking up to the aftermath of a icy/freezing rain/snow/sleet storm from yesterday. What started as a two hour delay is now another day off of school. I've been watching the news waiting to hear that school is closed. We bought a new bed this weekend - after we tried out several. We went for a hybrid memory foam/inner spring combo - it seemed to be the most comfortable. I'm really thankful that my hubby and I are in agreement that a softer bed is best (I personally couldn't get comfy on those firm mattresses). 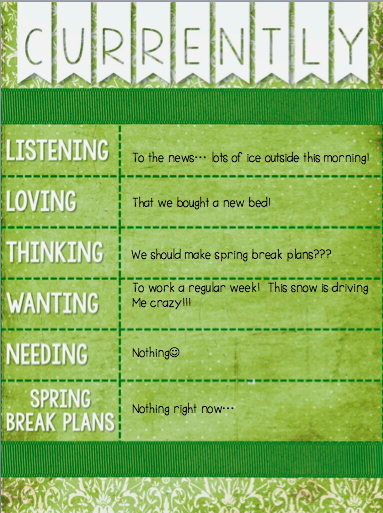 I've not thought about spring break until this morning, so now I'm wondering if we should make some plans? We can't plan much because we have so much planned this spring/summer that will be really expensive. Maybe I can find a Groupon for Gray Wolf Lodge? We've never been, but it is really expensive (even with a coupon). We might just stay home! We have had a closing or delay every week (usually more than once a week) since mid-January. I just want a regular week!!! I don't need anything at the moment - I'm a very lucky girl! I'm off to find out what everyone else is up to:) Happy Monday! I've never thought about a hotel - that might actually be a perfect solution:) My kids are young (5 and 1), and I worry that my baby won't actually be able to do many of the things at Great Wolf Lodge. As for sleeping in, my hubby and I wake up early to work out together (great motivation), so even when we have a delay, I go ahead and get up. It has worked out fine though, because my kids get up early (by 6:00) every day, so it is nice to have worked out and showered by myself, before going into full-blown mommy mode! I'm in upstate New York and we've also had a rash of snow days and delays that just throw everything off - especially the kids! I'm hopeful we can make it through the week, although it's not looking good with Wednesday's forecast! Personally my favorite vacation is a stay-cation. I love just being home with my hubs and dogs in my pjs sitting on the couch! I hope your weather gets better and March is a wonderful month for you!